Here's another one of my favorite places in Naga City -- Casa Moderna. Casa Moderna is a quiet little bakeshop and snack stop and it's the place to go for the softest and tastiest Pan Bonete. Pan Bonete is a kind of bread that looks like a bonnet, thus the name. It is best eaten hot off the oven, paired with noodles or ice cream. The bakeshop sells pan bonete around 2 in the afternoon. It was already four in the afternoon when we passed by the place yesterday and pan bonete was already out of stock. We ended up having toasted siopao instead. 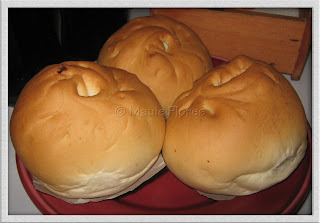 Last January, I wrote about 3N Bakery's toasted siopao, the one that I bought while in Daet. 3N Bakery also has a branch beside the Naga City Public Market. Casa Moderna's toasted siopao was bigger and it has less filling. It doesn't have a slice of boiled egg, too. Still, it tasted good though I like 3N's more. 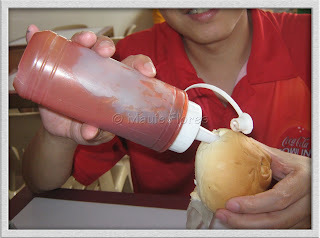 This is the first time I had toasted siopao with ketchup. It looked funny but surprisingly it tasted good. Aside from Pan Bonete and Toasted Siopao, Casa Moderna is also well-known among Nagueños for its Pancit Palabok and Pancit Bihon topped with Lechon Kawali. Casa Moderna Bakeshop has two branches in Naga City. One is in the town proper while the branch we visited was in Queborac Street.